Kerry defeated Cork by 1-11 to 1-6 in the Munster Senior Football Championship Replay on Saturday July 18th at Fitzgerald Stadium Killarney. Paul Geaney’s goal with 20 minutes to go was the key score as Kerry defeated Cork to win their 77th Munster title in the Munster SFC Final replay on Saturday night in Killarney. On a wet, dark evening at Fitzgerald Stadium, Kerry ground down a competitive Cork side in a match that was not conducive to a good game of football. There was just a point between them at the break, Kerry leading by one, and the sides were level with 20 minutes to go when a quick thinking Colm Cooper set up Geaney for the vital goal. Cooper took a quick free into Donnchadh Walsh, Walsh’s shot broke to Geaney and Geaney rattled home to the net. That put Kerry three ahead, and Cork didn’t actually score again as Kerry hit the final two points of the game in a dour closing quarter to win by five. Kerry had Stephen O’Brien sent off late on, but it mattered little as the Kingdom were very comfortable at the end. Cork only scored two points in the entire second half, and overall, Kerry were much improved from their below par display in the drawn game two weeks ago. Kerry led by a point at half-time after a first half that struggled to get going in light of the poor weather conditions, with wind and rain prevailing in Killarney. The sides shared the first four points, Colm O’Neill and Donncha O’Connor slotting frees for Cork either side of Kerry points from Walsh and Bryan Sheehan (free). Sheehan’s freetaking, as ever, was a joy to behold in the first half as he hit five placed balls between the posts. His second followed two smart breakaway Kerry points from Geaney and that left a sharp looking Kingdom 0-5 to 0-2 ahead after 14 minutes. Cork responded quickly with points from O’Neill and Brian O’Driscoll, but two frees from Sheehan – including an absolute stunner from 60 metres – left Kerry 0-7 to 0-4 ahead with five minutes left to the break. Then came the Cork goal. The Rebels held possession intelligently in the middle third before a sharp ball inside found O’Neill. In an instant, O’Neill released to the onrushing Paul Kerrigan, and the Nemo Rangers flyer brushed off the attention of two diving Kerry defenders to lash past Brendan Kealy into the roof of the net. Cork dominated the closing minutes of the first half after the goal and they had their chances to go ahead. However, Kerry completed the first half scoring with another Sheehan free. Cork drew level early in the second half through Colm O’Neill, but Jonathan Lyne restored Kerry’s lead shortly afterwards. Cooper came on 10 minutes into the second half but Cork levelled immediately after the eight-time All Star’s arrival, Kevin O’Driscoll landing a superb point. However, on 50 minutes came the vital Kerry goal. David Moran’s long punt forward resulted in a scoreable free for Kerry, which Cooper held, seemingly set to shoot for a point. Then, in a moment not entirely unlike Mikey Sheehy’s 1978 stroke of genius against Dublin, Cooper took the free quickly and found Walsh. Walsh was clean through on Ken O’Halloran and he fired at goal. The shot ricocheted into the arms of Geaney, who showed great composure to put the ball past Michael Shields, who was trying to block on the line. Cork never recovered from this concession. Although Sheehan and Geaney were withdrawn before the end, Kerry found two points to extend their lead, with James O’Donoghue landing his only score of the game to leave them five clear with just five minutes to go. O’Donoghue had been superbly marshalled by James Loughrey throughout. Paul Galvin’s entrance as a substitute before the end provided the biggest cheer of the day for Kerry, the Finuge man making his first appearance since ending his retirement in March. Things ended somewhat sourly for Kerry with the dismissal of O’Brien, but the prevailing feeling for the Kingdom at the end was probably relief. They can now look forward to the All-Ireland quarter-finals in a few weeks, whereas Cork must beat Kildare in Round 4A next weekend to seal a place in the last eight. Subs: Colm Cooper for K Donaghy (45), Steven O’Brien for B Sheehan (58), Barry John Keane for P Geaney (62), Paul Galvin for D Walsh (66), Peter Crowley for Killian Young (69). Subs: Fintan Goold for D O’Connor (47), Conor Dorman for K O’Driscoll (54), Daniel Goulding for P Kelly (59), Tomás Clancy for Barry O’Driscoll (66), John Hayes for B Hurley (67). Colm Cooper came off the bench to set up the crucial score of the game as All-Ireland champions Kerry captured their 77th Munster SFC crown in a replay played in a downpour at Fitzgerald Stadium in Killarney. Cooper dispatched a quick free which led to Paul Geaney finding the net and taking the sting out of the Cork challenge after another good contest. The goal pushed the Kingdom three points in front and Cork never recovered and did not score again after that. Indeed, they managed only two points in the second-half and went scoreless from the 46th minute to the end and will now need to regroup for the qualifiers. The accuracy of Bryan Sheehan was decisive in Kerry opening up a 0-07 to 0-04 lead after half an hour, but they were rocked when Cork countered and Colm O’Neill set up Paul Kerrigan and he blasted to the net for the seventh goal the Kingdom have conceded in this year’s championship. Sheehan edged the Kingdom back in front just before the interval with his fifth free to lead by 0-08 to 1-04 at the break. O’Neill had given Cork a good start with the opening point after two minutes before Donnchadh Walsh and Sheehan got the All-Ireland champions ahead. Donncha O’Connor tied the sides with a free and they were level four times during the opening half as the huge crowd of 32,233 enjoyed the exchanges despite the constant wind and rain. Paul Geaney landed two good points for Kerry but O’Neill and Brian O’Driscoll responded for the Rebels to tie the sides again after 17 minutes. Three frees in-a-row from Sheehan saw Kerry open up a lead but then O’Neill put Kerrigan through and he shot home a fine goal. O’Neill tied the match four minutes after the restart before wing-back Jonathan Lyne went forward to edge Kerry back in front. Kerry manager Eamonn Fitzmaurice then introduced Colm ‘Gooch’ Cooper for Kieran Donaghy, but it was Cork who levelled when Kevin O’Driscoll landed an excellent effort from 45 metres to tie the sides a sixth time. But then Cooper made an immediate impact, taking a quick free which put Donnchadh Walsh through and while his effort was saved by Ken O’Halloran, the rebound fell to Paul Geaney and he sidestepped Michael Shields to shoot to the net from close range. KERRY: B Kealy; M Ó Sé, A O’Mahony, S Enright; J Lyne (0-01), K Young, P Murphy; A Maher, D Moran; J Buckley, B Sheehan (0-05, 0-05f), D Walsh (0-01); P Geaney (1-03, 0-01f), K Donaghy, J O’Donoghue (0-01). Subs: M Geaney for Buckley (30 mins), C Cooper for Donaghy (45 mins), S O’Brien for Sheehan (58 mins), P Galvin for Walsh (66 mins). CORK: K O’Halloran; M Shields, J O’Sullivan, J Loughrey; Barry O’Driscoll, Brian O’Driscoll (0-01), S Cronin; A O’Connor, P Kelly; P Kerrigan (1-00), D O’Connor (0-01, 0-01f), K O’Driscoll (0-01); C O’Neill (0-03, 0-02f), M Collins, B Hurley. Subs: F Goold for D O’Connor (47 mins), D Goulding for Kelly (55 mins), J Hayes for Hurley (67 mins). Munster GAA is delighted to announce that there will be two top artists providing pre-match entertainment at the Munster Senior Football Final replay at Fitzgerald Stadium Killarney on Saturday evening next July 18th. The Munster Council is asking supporters attending the replay to arrive early at the grounds. Stiles will open at 5pm and the entertainment will begin at 5.15pm with the vibrant and energetic traditional Irish musician, Liam O’Connor. Liam will be followed at 5.45pm by one of Ireland’s top singer/songwriters, the internationally acclaimed Ryan Sheridan. Cork will be on the pitch by 6.30pm and will be followed shortly afterwards by Kerry with throw in at 7pm. Supporters are advised that in order to avoid congestion at the stiles they should plan an early arrival at the stadium and by doing so they can enjoy 2 great musical acts in a relaxed atmosphere. Tickets for Saturdays game remain on sale through Centra and SuperValu shops and online at gaa.tickets.ie. Remember there is a discount of €5 on all adult tickets purchased before midnight on Friday night July 17th. 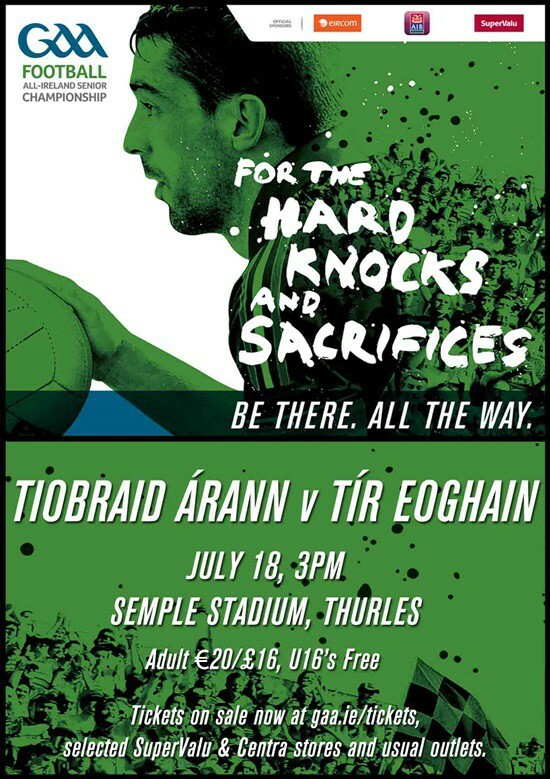 So don’t miss out, arrive early and enjoy two of Ireland’s best musical performers followed at 7pm by two of Ireland’s best Gaelic Football teams in Kerry and Cork. The Munster Senior Football Final Replay between Cork and Kerry will take place at 7pm on Saturday July 18th at Fitzgerald Stadium Killarney. The game will be televised live by RTE. All ticket prices for the replay will be reduced by €5 for tickets purchased up to midnight on Friday July 17th. Tickets purchased on the day of the game will be charged at full price. Students & OAP’s can buy full price Adult tickets and receive concession of €10 at designated turnstiles on the day. The Kerry Senior Football Team to play Cork in the Munster Senior Football Championship Final Replay in Fitzgerald Stadium Killarney on Saturday evening (7pm) shows 4 changes in personnel from the side that did duty in the drawn encounter between the sides. Aidan O’Mahony comes into the full back line in place of Fionn Fitzgerald; Paul Murphy returns after injury in the half back line instead of Peter Crowley; Anthony Maher is named in midfield with Bryan Sheehan moving to the half forward line instead of Stephen O’Brien and in the full forward line, Paul Geaney comes in for Barry John Keane. The substitutes list is notable for the return of Paul Galvin to the match day squad. 2. Michael Shields (St. Finbarr’s) Capt. Next Round – the winners qualify for the All-Ireland Quarter-Finals against Westmeath or Fermanagh on weekend of August 1/2/3, the losers qualify for the All-Ireland Qualifiers Round 4A against Kildare on Saturday July 25th. Stand – €35 – discounted price of €30 until midnight on Friday July 17th. Terrace – €25 – discounted price of €20 until midnight on Friday July 17th. Sideline – €20 – discounted price of €15 until midnight on Friday July 17th. Student / OAP – pay full or discounted price and get a refund of €10 at specified Stiles on the day (on production of valid Student/OAP I.D.) except for side-line where concession refund is €5. Won All Ireland championship defeating Donegal by 2-9 to 0-12 in the final. There have been 12 Munster championship replays between Cork and Kerry with Cork winning 7 of the replays compared to 5 for Kerry. There have been 3 replays at Killarney with Kerry winning 2 (1961 and 1982) and Cork winning the other in 1987. The last 4 replays have been at Páirc Uí Chaoimh with Cork winning 3 (2002, 2006 and 2009) to Kerry’s 1 victory in 2010. In the last 4 Munster championship meetings between Cork and Kerry at Fitzgerald Stadium, Kerry won the 2011 and 2013 finals and drew the 2010 semi-final and 2015 final. Cork’s last championship victory over Kerry in Killarney was the 1995 Munster Final on a scoreline of Cork 0-15 Kerry 1-9. Kerry have never beaten Cork in the Munster Senior Football Championship at a neutral venue (it happened 3 times!). Cork have never beaten Kerry in the All-Ireland Championship at Croke Park. “Points win games”!! – Or so you would think until this year’s drawn Munster final looking at the recent record of Cork and Kerry. Neither County had recorded more than 1 goal in Munster Senior Football Championship meetings since the 2000 Munster Semi-Final which Kerry won by 2-15 to 1-13. During the 17 subsequent Munster Championship matches between the counties, they combined to score a total of just 14 goals between them in the first 16 and then in the drawn game there were 5 scored between them. The highest score by an individual team in a Cork vs. Kerry Munster Senior Football Championship match was the 1976 Munster Final replay at Pairc Ui Chaoimh which Kerry won by 3-20 to 2-19. The highest margin of victory between the teams was in the first round match in 1937 played at Killarney with Kerry winning by 6-7 to 0-4 – a margin of 21 points. In the 1890 Munster Senior Football Final, Laune Rangers (Kerry) and Midleton (Cork) were the finalists. The game was 57 minutes old, with the sides scoreless, when the ball burst and as there was no replacement ball the game could not continue and was abandoned. In the 1893 Final, Laune Rangers (Kerry) and Dromtarriffe (Cork) were fixed on two occasions to play this final in Millstreet but the Kerry side did not travel. The game was fixed for a third time in Mallow but there was still no show from the Kerry side and Cork received a walkover. Since 2000, Kerry have drawn as many matches in the Munster Senior Football Championship than they have lost, 5 draws (4 v Cork & 1 v Limerick) as compared to 5 defeats (all v Cork) in 41 matches played. 2008 – 21 scores per game; 2009 – 24; 2010 – 28; 2011 – 33; 2012 – 27; 2013 – 30.8, 2014 – 28.6; 2015 so far: 29.2. This entry was posted on Saturday, July 18th, 2015 at 9:00 pm and is filed under events, News, Videos. You can follow any responses to this entry through the RSS 2.0 feed. Both comments and pings are currently closed. Tyrone defeated Tipperary by 0-19 to 0-7 in round 3B of the All Ireland Football Qualifiers on Saturday July 18th at Semple Stadium Thurles. Tyrone demolished Tipperary by 12 points in this afternoon’s All-Ireland SFC round 3B qualifier, running out 0-19 to 0-07 winners in front of 4,620 spectators at Semple Stadium. Mickey Harte’s Red Hands ran riot in the second half, outscoring the hosts by 0-12 to 0-01. Tyrone led by 0-07 to 0-06 at the break as tempers boiled over on the stroke of half-time, with players from both sides becoming involved in a number of scuffles. And it turned into a dreadful second half for Tipp as they fell to a big defeat. In a game that was billed as a grudge match following the controversial All-Ireland Under-21 final between the counties, the Premier County had seven players booked, one black carded and another sent off. Liam Casey was handed a red card in the 56th minute, just two minutes after coming on, for a stamp on Colm Cavanagh. Experienced defender Ciaran McDonald was black-carded soon after as the Tipp challenge crumbled. That exchange of pleasantries before half-time seemed to benefit Tyrone more as they turned up the heat in the second half, with Tipp desperately lacking inspiration all over the pitch. Despite playing against the breeze, Tyrone romped to a comfortable win to book their place in round 4B. Free-takers Darren McCurry and Connor McAliskey finished with five points each but the Cavanagh brothers, Sean and Colm, were both excellent, along with Peter Harte. For Tipp, this is a major setback after running Kerry to six points in the Munster semi-final, followed up by a 21-point victory over Louth last weekend. Tyrone flattered to deceive against Meath but this was a much-improved display from the Ulster men. They were 0-07 to 0-06 clear at half-time before unloading with ferocity on Tipp in the second half. The hosts managed just one point in the entire second half – a 66th minute Kevin O’Halloran free – as Tyrone turned up the heat. And yet the sides were level at 0-04 apiece by the 19th minute as Tipp recovered from falling three points down to level. O’Halloran was in good form from placed balls but Tipp were finding it difficult to break through the massed Tyrone ranks. Mickey Harte’s men packed bodies behind the ball and broke with pace when they had the opportunities to do so. And once they got into their stride in the second half, they were simply too good for Division 3 opponents. TIPPERARY: E Comerford; A Campbell, P Codd, C McDonald; S Kennedy, R Kiely (0-01), B Fox; P Acheson, C O’Riordan; G Mulhair, S O’Brien, P Austin; K O’Halloran (0-05, 4f 1 45), M Quinlivan (0-01), C Sweeney. Subs: J Lonergan for Sweeney (40), L Casey for O’Brien (54), J Feehan for McDonald (b/c 59), B Grogan for Austin (61), B Mulvihill for O’Riordan (65), C O’Shaughnessy for Mulhair (67). TYRONE: N Morgan; A McCrory, R McNamee, C McCarron; R McNabb, J McMahon, P Harte (0-02); C Cavanagh (0-03), M Donnelly (0-03); T McCann, M Bradley, C Meyler; D McCurry (0-05, 3f), S Cavanagh, C McAliskey (0-05, 3f). Subs: C McCann (0-01) for McCurry (51), B Tierney for Meyler (58), C Clarke for C Cavanagh (61), R O’Neill for Bradley (61), P McNulty for Harte (63), C McShane for McAliskey (67). Student / OAPs: €15.00/£12.00 can be purchased at the venue with valid I.D. The Tipperary Senior Football team to play Tyrone, in the GAA Football All-Ireland Senior Championship Round 3B, in Semple Stadium, on Saturday next July 18th at 3pm has been announced by manager Peter Creedon. It shows one change to the side announced for last week’s fixture against Louth with Martin Dunne from Moyle Rovers getting the nod at number 9 partnering Colin O’Riordan. This entry was posted on Saturday, July 18th, 2015 at 12:00 am and is filed under events, News. You can follow any responses to this entry through the RSS 2.0 feed. Both comments and pings are currently closed.